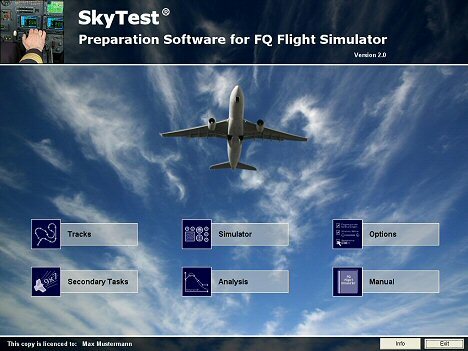 The FQ-Simulator requires participants to navigate an aircraft through several tracks by instrument flight rules. Standard cockpit instruments are your only guidance in this test. You are to conduct the flight with a minimum of deviation from track. 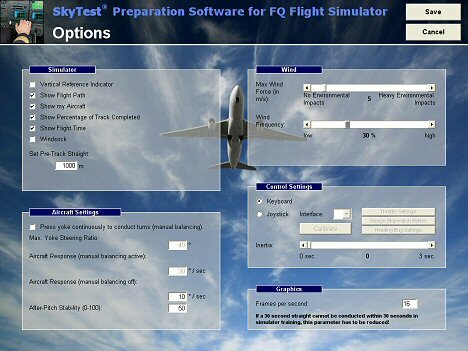 Instrument Flight Simulator designed for DLR FQ-preparation. Predesigned and custom tracks. Software comprises all standard legs including additional climb and descent flight tasks. You may organize your tracks in a track management tool and share tracks with other users. Comprehensive setting options for early and advanced level training – such as additional navigation information on display, control options, custom environmental impacts, aircraft and steering response setting and graphic options. Extensive after-flight analysis that states vertical and horizontal deviation from track to review your performance in detail. Audio and visual secondary tasks (stereo hearing test and arithmetical problems) to enhance your multi-tasking capacity with. Comprehensive electronic user manual with additional background information.